I think every kid who grew up during the '60s, '70s, and '80s has a soft spot in his heart for pinball. I know I did. During college, I spent more time than I ought to have in the arcade playing pinball with the cool theater and comp sci people, and for a couple of years in the mid-90s I actually owned a vintage 1980 Bally Flash Gordon pinball machine. I don't play nearly as much as I used to, but between my time on physical machines and my time spent playing computer pinball simulations (anyone remember Night Mission for the Apple II? ), I've managed to maintain a skill level high enough that my wife refuses to play with me. For me, a good pinball game does several things. First, the game is designed so the ball can be kept in play with no obvious bias to drains on the left, right, or center. Second, the rules are deep--you can have fun without actually knowing what the rules of the game are, but once you learn them, the game really opens up. Third, it's nice to have an interesting story line or premise to the game even if it makes little sense, so you can keep track of the various goals you must accomplish in the game. 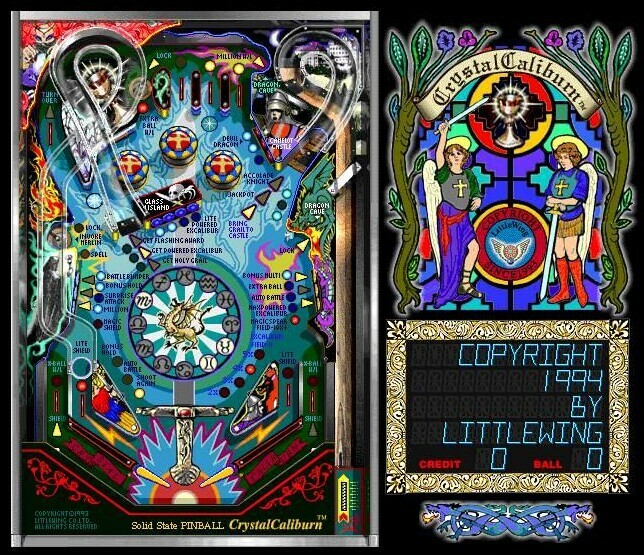 Little Wing is a Japanese company that has been around since 1990 and produces only pinball games. They also seem to have some sort of obsession with the Arthurian legend as no less than three of their games (Tristan, Crystal Caliburn, and Golden Logres) have some aspect of the knights of the round table as their central theme. Game play is balanced so the ball does not have an undue tendency to drain to a particular direction. To help with this, most of their games feature kickbacks in the left and right outlanes to give you at least one more chance on those outlanes. 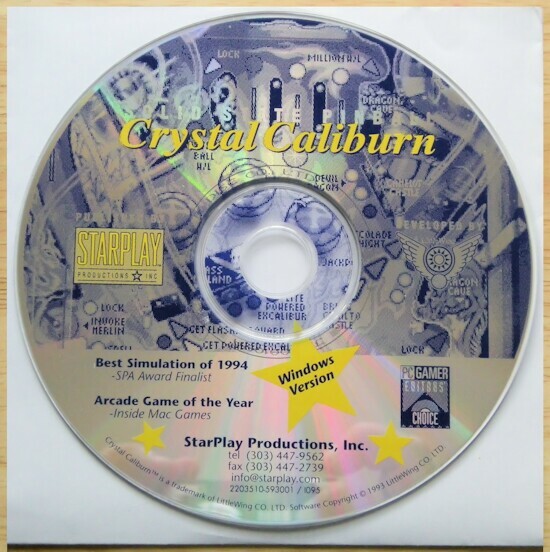 Crystal Caliburn used the second generation game engine. The playfield has been tilted back to show a little bit of perspective, compared with earlier games. Ramps have been added to the playfield to give another dimension to play. Sound is continuous and the sound effects have become more elaborate. The physics engine has been improved as well and plays without any outlanes vs. center bias. In short, the game is stunning for the time period in which it came out.